And when it comes to writing your About Page? Ugh. What a drag, right? Who likes to go on and on about how great they are? I'd rather poke needles in my eye. WHEN YOUR WEBSITE IS WORKING 24/7 TO BOOK YOU CLIENTS, YOUR ABOUT PAGE IS THE PAGE THAT'S GOING TO BE WORKING THE HARDEST. If you've been dragging your heels when it comes to writing or updating your About Page, I can help you. 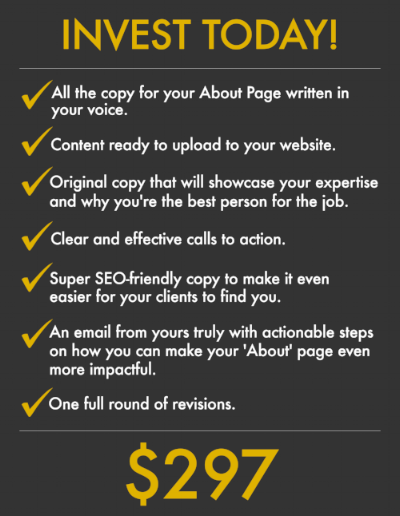 With About Page In a Box you'll get all of the copy for your 'About' page delivered to you within 12 days of completing my incredibly in-depth questionnaire. Once payment is made you'll get instant access to the About Page in a Box Welcome Pack. This pack includes a link to my 'Let's Magnetise Your Clients' questionnaire. Your About Page is an opportunity to self yourself as you would your products or services. Remember: people buy from people. Your About Page is your opportunity to create a real human connection. To tell your story. To woo your ideal clients and get them buying from you over someone else. You want your About Page to be a conversation starter. To give your ideal clients something to hook on to. To charm them in a way that makes them feel like they already know you.